I am the last President of the United States! 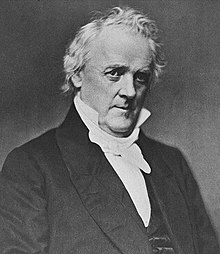 James Buchanan, Jr. (23 April 1791 – 1 June 1868) was the 15th President of the United States (1857–61), serving immediately prior to the American Civil War. He represented Pennsylvania in the United States House of Representatives and later the Senate, then served as Minister to Russia under President Andrew Jackson. He was named Secretary of State under President James K. Polk, and is to date the last former Secretary of State to serve as President of the United States. After Buchanan turned down an offer to sit on the Supreme Court, President Franklin Pierce appointed him Ambassador to the United Kingdom, in which capacity he helped draft the Ostend Manifesto. As President, he was often called a "doughface", a Northerner with Southern sympathies, who battled with Stephen A. Douglas for control of the Democratic Party. Buchanan's efforts to maintain peace between the North and the South alienated both sides, and the Southern states declared their secession in the prologue to the American Civil War. You have lost a child, a dear, dear child. I have lost the only earthly object of my affection.... I have now one request to make,... deny me not. Afford me the melancholy pleasure of seeing her body before internment. Letter returned to him unopened, to the father of his former fiancée Ann Coleman, written after her death, rumored to have been suicide soon after her breaking of their engagement. (1819). I shall not again be a candidate for the Presidency...I shall be 65 on the 23rd April next, and I had determined upon my line of life from the remnant of days with which a kind Providence might bless me, discarding every idea of the Presidency...I can now leave public life, I trust, with credit. Should I become President, the case may be very different, after I shall have worn myself out with the toil and anxiety of the office. Responding to suggestions that he run for President in 1856, as quoted at wheatland.org. All agree that under the Constitution slavery in the States is beyond the reach of any human power except that of the respective States themselves wherein it exists. May we not, then, hope that the long agitation on this subject is approaching its end, and that the geographical parties to which it has given birth, so much dreaded by the Father of his Country, will speedily become extinct? Most happy will it be for the country when the public mind shall be diverted from this question to others of more pressing and practical importance. Throughout the whole progress of this agitation, which has scarcely known any intermission for more than twenty years, whilst it has been productive of no positive good to any human being it has been the prolific source of great evils to the master, to the slave, and to the whole country. It has alienated and estranged the people of the sister States from each other, and has even seriously endangered the very existence of the Union. Nor has the danger yet entirely ceased. Under our system there is a remedy for all mere political evils in the sound sense and sober judgment of the people. Time is a great corrective. Political subjects which but a few years ago excited and exasperated the public mind have passed away and are now nearly forgotten. But this question of domestic slavery is of far graver importance than any mere political question, because should the agitation continue it may eventually endanger the personal safety of a large portion of our countrymen where the institution exists. In that event no form of government, however admirable in itself and however productive of material benefits, can compensate for the loss of peace and domestic security around the family altar. Let every Union-loving man, therefore, exert his best influence to suppress this agitation, which since the recent legislation of Congress is without any legitimate object. Inaugural address (4 March 1857). A statement he is reported to have made several times to others after the secession of South Carolina, or as early as after the election of Abraham Lincoln (1860), as quoted in Lincoln's War: The Untold Story of America's Greatest President as Commander in Chief (2004) by Geoffrey Perret. The course of events is so rapidly hastening forward that the emergency may soon arise when you may be called upon to decide the momentous question whether you possess the power by force of arms to compel a State to remain in the Union. I should feel myself recreant to my duty were I not to express an opinion on this important subject. The question fairly stated is, Has the Constitution delegated to Congress the power to coerce a State into submission which is attempting to withdraw or has actually withdrawn from the Confederacy? If answered in the affirmative, it must be on the principle that the power has been conferred upon Congress to declare and to make war against a State. After much serious reflection I have arrived at the conclusion that no such power has been delegated to Congress or to any other department of the Federal Government. It is manifest upon an inspection of the Constitution that this is not among the specific and enumerated powers granted to Congress, and it is equally apparent that its exercise is not "necessary and proper for carrying into execution" any one of these powers. So far from this power having been delegated to Congress, it was expressly refused by the Convention which framed the Constitution. Speech before Congress (3 December 1860). It is said that serious apprehensions are to some extent entertained (in which I do not share) that the peace of this District may be disturbed before the 4th of March next. In any event, it will be my duty to preserve it, and this duty shall be performed. In conclusion it may be permitted to me to remark that I have often warned my countrymen of the dangers which now surround us. This may be the last time I shall refer to the subject officially. I feel that my duty has been faithfully, though it may be imperfectly, performed, and, whatever the result may be, I shall carry to my grave the consciousness that I at least meant well for my country. Speech to Congress (8 January 1861). Sir, if you are as happy in entering the White House as I shall feel on returning to Wheatland, you are a happy man indeed. Sir, if you are as happy in entering the White House as I shall feel on returning [home], you are a happy man indeed. If you are as happy entering the presidency as I am in leaving it, then you are truly a happy man. Earlier variant: Some knave or fool got up a lie from the whole cloth and it was telegraphed over the country that I was about to purchase or had purchased a place somewhere else and would not return to Wheatland. If my successor should be as happy in entering the White House as I shall feel on returning to Wheatland he will indeed be a happy man. I am just now in my own mind chalking out the course of my last message. In it, should Providence continue his blessing, I shall have nothing to record but uninterrupted success for my country. The trouble about the slavery question would all have been avoided, had the Country submitted to the decision of the Supreme Court delivered two or three days after my inaugural. Letter to William Carpenter (13 September 1860); as published in Historical Papers and Addresses of the Lancaster County Historical Society. As quoted in Presidential Leadership : Rating the Best and the Worst in the White House (2004) edited by James Taranto and Leonard Leo. Violence reached the floor of the United States Senate, where Congressman Preston Brooks of South Carolina savagely beat Abolitionist Senator Charles Sumner with his cane. Southern sympathizers sent Brooks new canes. Members began carrying knives and pistols into the Chamber. Meanwhile, the Nation's Chief Executive, James Buchanan, did nothing. There is a wrong impression about one of the candidates. There is no such person running as James Buchanan. He is dead of lock-jaw. Nothing remains but a platform and a bloated mass of political putridity. It has been suggested that the President intentionally left those forts in a bad condition, that South Carolina might seize them before his successor had time to take means for their safety. I cannot believe it; I will not believe it, for it would make Mr. Buchanan a more odious traitor than Benedict Arnold. Every drop of blood that shall be shed in the conflict would sit heavy on his soul forever. This page was last edited on 25 April 2019, at 21:06.